It's hard to nail down the classics. The differences can be subtle, and the research can take you far and wide. The picture above illustrates that fact. 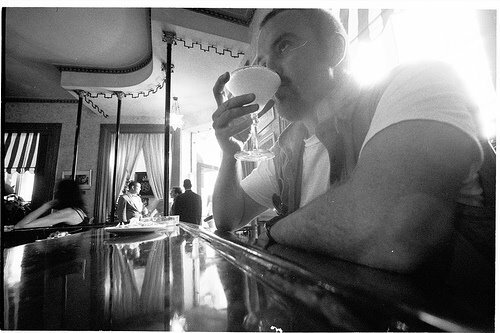 That's me researching the daiquiri. When you order one, you never know what you're going to get. The key to a simple classic like this is getting the proportions just right. Field work is one thing, but I've been reading up on the various versions of this classic. Except for that bit at the end about the grenadine, this is quite a standard recipe. It's quite similar to what you'd find today in Wondrich's Esquire Drinks or Gary Regan's Joy of Mixology. If you do add the grenadine, I think it stops being a Daiquiri and becomes a Bacardi Cocktail, Country Club Style (see Bullock's Ideal Bartender over at slakethirst). And just to muddle things (so to speak) Embury mentions a Daiquiri Grenadine which he says goes by the name Santiago, but which we would call a Bacardi Cocktail. And that is quite similar to what I'm making as my standard, except that I'm shaking it hard and serving it up in a cocktail glass. 3/4 oz fresh squeezed lime juice. Shake hard over ice. No garnish. No grenadine. I'd like to hear what other people are using as their "standard" Daiquiri. *This book is so good and important, I think it deserves an acronym. Note it also can stand for Very Special Effing Cocktailbook. Bacardi, much to the disgust of astute practitioners of the compounding art. grenadine is added, the Bacardi becomes a Santiago"